Wrestling Looks Towards the Conference Championship | The Gettysburgian. 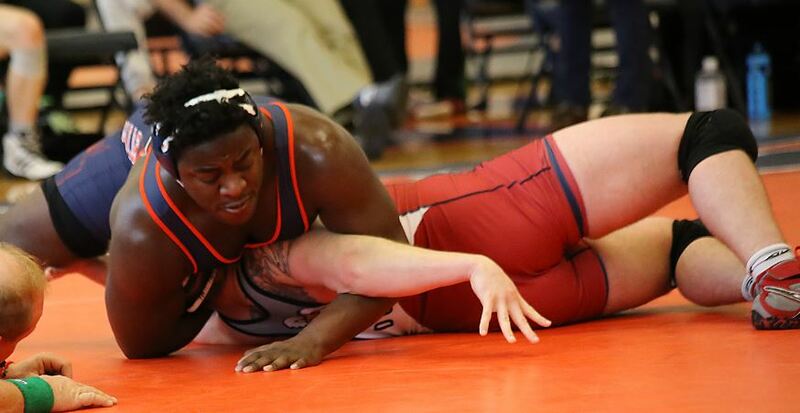 The Gettysburg College wrestling team has officially wrapped up its season, splitting its final two matches at Ursinus College. They will head to the United States Merchant Marine Academy for the Centennial Conference Championship on Feb. 9. The Bullets had ups and downs season, finishing with an overall record of 7-7 and 2-5 in Centennial Conference action. However, the team will be ready to compete come championship time. Sophomore Sean Thompson had a breakout season last year and continued his success this season. As a first year, he had the third most wins on the team, second most takedowns, and led the team in points scored on bottom. With 19 victories this season, he is tied for 5th most on the team. A very reliable wrestler, he will look to continue his success in the championships as well. In addition to his great year, Colin Kowalski has had an outstanding career at Gettysburg. He recently hit the 100-career win mark and has been on a mission all season. As of his last match, Kowalski is ranked 10th in the nation at 165 and has posted a 30-win season. He will look to perform very well at the championship. Heavyweight Paul Triandafilou has also had an incredible career at Gettysburg, one of the best performers in school history. A two-time NCAA Qualifier and former All-American, he has continued his dominance in his senior season as well. This season, Triandafilou also hit the 100-career win mark this season and saw himself ranked 8th in the nation as of his last match. With 26 wins this season, he will also look to dominate at the conference championship. The Bullets have finished in the top-4 teams in the last three conference championships, but this season they are poised to take the top spot. They have never won a team title at the championships, but this season they have the strength and talent to do so. Triandafilou has won the heavyweight title twice in his career. If he takes the title again this season, he will be the first three-time conference heavyweight champion since 2005, and the first Bullet to win three titles since 2009. The duo of Triandafilou and Kowalski represent one of the strongest duos in school history. They give the best chance at the Bullets earning two champions since 2008. They are the first pair of classmates to enter the championship with over 100 career wins apiece. Opening matches will begin at 10:00 a.m. on February 9th, and there will be online streaming to view the event as well.